The Master’s pedestal was commissioned by James McConnell, the Scientific Lodge’s first Master and was almost certainly made in Wolverton Works. It was first mentioned in an inventory of Lodge possessions in 1868. The brass symbol of the front of the pedestal represents a stone mason’s square. 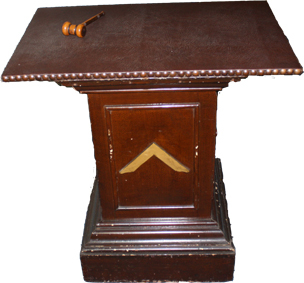 In Masonic ceremonies the Master of the Lodge sits at this pedestal. Was Mr Herbert Luann a member of this Lodge ?